Devotees at prayer in front of the tabernacle at the Santhome Basilica in Chennai, India. I made this photo in a beautiful chapel at the Santhome Basilica in Chennai in South East India. If you like the image you probably do for the same reason I was originally attracted to it: color, that of the tabernacle and the stained glass windows that sit either side of it. Closer inspection of the image will reveal that it’s composition, as much as light and color, that underpins the success of this photo. Seeing In Pairs | Do You Accept The Challenge? That’s right folks, it’s just like the Ark. See how many pairs of objects you can discover within this image. For starters there’s the pair of stained glass windows. But this photo is full of matching pairs. Why not challenge yourself for just a few moments to see how many pairs you can discover. Just ask the Minbari, one of the races on the classic Sci-Fi TV series Babylon 5, how important the number three is in their society. Perhaps one of the reasons why groupings of three are so important in composition is because, when placed into a triangular arrangement, shapes within your image tend to become more pronounced. The illusion of three dimensional space within the bounds of a two dimensional photograph is, therefore, enhanced. Notice how the three people in the image at the top of this post are grouped into a nice triangular shape. 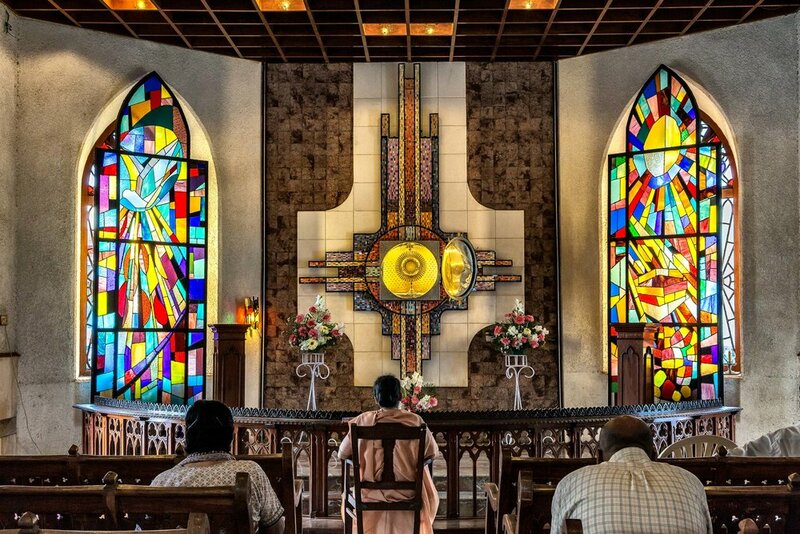 You might also notice the color of the woman’s sari and how it relates to similar colors in the stained glass windows and around the tabernacle. A retailer, amidst a sea of color, in his store in Kolkata, India. It’s true to say that I almost never think of such things when photographing. I would say, however, that I recognized many of the compositional relationships existing in this image while composing the photo. While that recognition does effect my compositional choices, it all happens pretty much on auto pilot. The trick is not to let the thinking get in the way of the doing. I think the best way to elevate yourself to that level of expertise is to spend time deconstructing your favorite photos, whether made by you or someone else. Recognize what it is that works in these pictures and, over time, notice how the same decision making will begin to appear in your own photography. There’s so much more to a great photo than whether or not Little Johnny is smiling. Paying attention to composition when looking at photos that inspire you will, over time, produce dramatic improvements in your own photography. Of this I am sure.